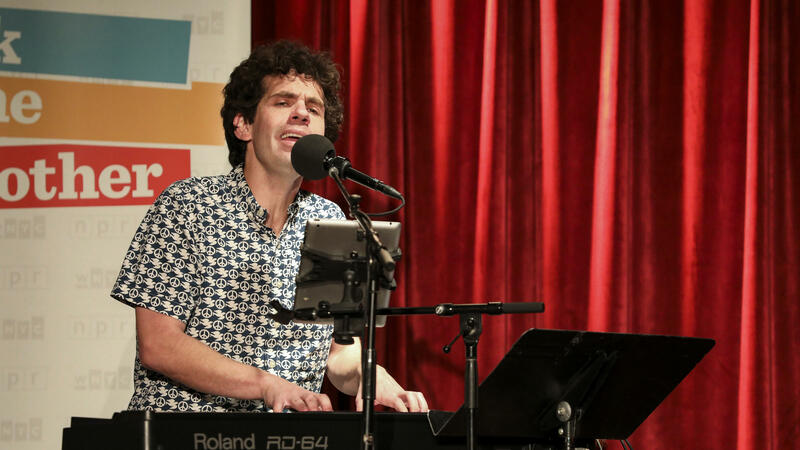 Guest musician Julian Velard leads a music parody game on Ask Me Another at the Bell House in Brooklyn, New York. JULIAN VELARD, BYLINE: This is NPR's ASK ME ANOTHER. I'm Julian Velard. Now here's your host, Ophira Eisenberg. Thank you, Julian. Before the break, we met our contestants, Brianna and Kristina. Soon they'll play a game about Nobel Prize recipients. It's like I always say - Stockholm is where the heart is. EISENBERG: Let's check in with them. Brianna, you taught yourself how to walk on stilts and ride a unicycle. BRIANNA LEARY: I did (laughter). EISENBERG: Which is great. But the question is why. LEARY: ...Walked on the stilts (laughter). EISENBERG: You were the one adult that was like, I just need to show off right now. LEARY: Yep. All the kids were like, wow. VELARD: I had a friend in junior high school who used a unicycle. EISENBERG: Not Jordan Peele. Oh, a different friend? EISENBERG: Kristina, you like to hunt for food trucks, especially taco trucks, which is great. I just - I love the food truck scene, too. Now, with the taco trucks, let's just discuss this. How much variation is there in how good a taco is from a taco truck? EISENBERG: OK. Don't give me the eyebrows. EISENBERG: All right. What makes a brilliant taco for you? SEPULVEDA: The meat can't be dried out. Condiment selection. Are they fresh? Have they been turned over? Tortilla - stale or not. EISENBERG: OK. So far we're just talking about health standards. EISENBERG: You're like, if there's a rat tail, definitely not in the top 10. EISENBERG: So your next game is a music parody game called Nobel Winner Takes It All. How does it work, Julian? VELARD: In honor of famous Swede Alfred Nobel, we rewrote the Swedish band ABBA's hit songs to be about Nobel Prize laureates. And we are counting economics as a Nobel Prize. If you don't like that, please send your complaints to planetmoney@npr.org. VELARD: Ring in to identify the laureate I'm singing about. And if you get that right, for a bonus, you can identify the original ABBA song title. EISENBERG: Kristina, you won the last game. So you win this, and you're in the final round. Brianna, you need to win this or, speaking of Sweden, you'll be locked in an Ikea for a week with nothing to help you escape but one of their Allen keys. EISENBERG: OK. Here we go. VELARD: ...(Singing) Ooh. Ph.D., French degree, killer of family genes. EISENBERG: That is correct. Yes. EISENBERG: Physics in 1903 and chemistry in 1911. By the way, she shared the physics prize with her husband. Their daughter and son-in-law shared the Nobel Prize in chemistry for their new discovery of radioactive elements. They're the family with the most Nobel Prizes of anyone. There is one other younger sister who took improv classes. VELARD: For a bonus, can you name the original song? (Singing) Controversial recent laureate. Baby boomers could not resist you. Does a lyric count as poetry? He broke a hundred-year Nobel law. Critics don't get too effusive, ooh, when he's not acoustic. He was a ceremony no-show. VELARD: For an extra point, can you guess the song? VELARD: (Singing) He writes all night. He writes all day. John Maynard Keynes is his bae. It ain't sad. He writes things for The New York Times, and still the banks commit more crimes. Free trade's not bad. In his books, he has a plan for reining in the wealthy man before awaits financial fall, "The Conscience Of The Liberal." EISENBERG: Brianna, can you steal? LEARY: I have no idea (laughter). EISENBERG: We were looking for Paul Krugman. VELARD: And the original ABBA tune is is "Money, Money, Money." Here comes the next one. (Singing) Climate change is honestly a bummer, an inconvenient truth like Florida's polling booth, environmentalist VP, too. EISENBERG: That is correct, yes. EISENBERG: Nobel Prize in Peace, the Peace Prize in 2007. VELARD: And for a bonus point, can you guess the song? (Singing) There was something in the books he'd write, didn't keep it light, gabito. He was the patron of Colombia, times of cholera, gabito. The magical and the real, metaphors of steel. And "100 Years Of Solitude," it's not for prudes, gabito. EISENBERG: That is correct, yes. Gabriel Garcia Marquez is right - Prize for Literature in 1982. A hundred years of solitude sounds pretty good right about now. VELARD: OK, do you know the song? EISENBERG: I know, it's hard not to sing. SEPULVEDA: It's the only way I get the titles. VELARD: This is your last clue. (Singing) My, my, Calcutta, the poverty did offend her. Oh, yeah, and she served as missionary in controversial ways. But even now with those complaints can't say this woman's not a saint. EISENBERG: The Nobel Peace Prize in 1979. EISENBERG: All right, Brianna, you were awesome. Thank you so much. EISENBERG: Kristina, you won both games, and you are moving on to our final round.